Frighten pond predators and unsuspecting friends with this realistic reptilian replica. Gator Pond Decoy is sure to make heads turn whether wildlife or human. Exceptional detail makes this floating alligator head a valuable deterrent for unwanted pond visitations. Gator decoy floats freely across koi ponds and water gardens, demonstrating life-like motion with wind or water movement. Reflective red eye stickers add to realism. Great for any water area infested with geese, egrets, cormorants, herons and other unwanted wildlife. (we have had limited success with mallards & wood ducks. Northern ducks seem to want to be friends with the decoys). Made from durable urethane foam. Protect prized koi and other pond fish with your very own "guard gator." 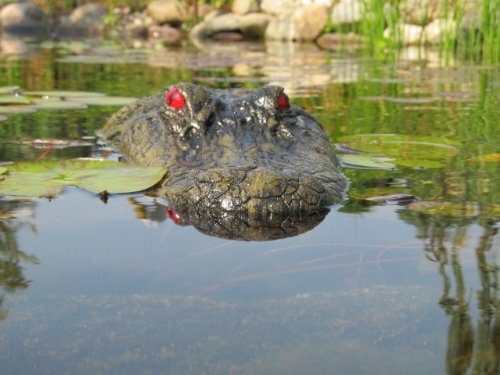 Add a little fun to your pond, while protecting your valuable fish This 22½ inch floating alligator floats freely and life-like in the pond or pool. This realistic, life-sized floating replica of an alligator head is perfect for any water area infested by birds geese, ducks, egrets, cormorants, heron and more Ideal for golf courses, park districts, fish and shrimp farms, industrial park lakes and even residential pools The 22½" long x 8½ " head moves realistically with the wind and water. Birds think that they're being followed by a predator so they leave for a safer area. Made entirely in the United States. The Jr Gator Pond Decoy measures 22½" x 8½" x 3" high. EACH ALLIGATOR IS PAINTED WITH UV RESISTANT PAINT TO LAST MANY YEARS! Note: Can also be used as a kickboard in swimming pools! We also produce a 28 inch version that has exposed teeth which is available on Amazon.com as well as a set of the 22 inch & 28 inch Alligator Head Decoys (BEST VALUE). Put the kit of two in your water and see how much better they scare away predators & sometimes people. Make sure to read the customer reviews to get a better idea on how well the product works in real life situations. If you have any questions about this product by TJB-INC, contact us by completing and submitting the form below. If you are looking for a specif part number, please include it with your message.